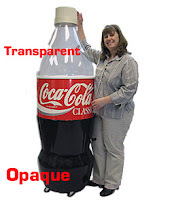 We posted a quiz last week on Opaque Plastic. Here are the voting results of optical properties of Opaque Plastic. 20% voted - Light will pass through. Can be seen through. 40% voted - Light will not pass through. Cannot be seen through. 40% voted - Light will pass through. Cannot be seen through. Opaque - Light will not pass through. Cannot be seen through. This is something that is easily confused. Plastic is often classified relative to light penetration because many plastics possess unique properties. There are 4 different types of light penetration It is much easier to differentiate them when their properties are side by side. Transparent - Light will pass through. Can be seen through. Translucent - Light will pass through cannot be seen through. Luminescent - (a) fluorescent: emits light only when electrons are being excited, usually transparent; (b) phosphorescent: gives off light energy more slowly than it takes on light, translucent.